On paper, the Desert Daze Caravan tour lineup was enticing, to say the least. However, no one could have predicted the legendary caliber of performances that took place on March 4th at The Regent Theater. To start, the visual projections that took place throughout the night (by Moon Block and Discordian Design) were phenomenal. During each set, seven projectors lit up the stage with live blotches of colored water and oil that were reminiscent of a lava lamp. In between sets, there were unique clips of cartoons such as one that seemed to be a yeti riding a skateboard. I was also extremely impressed with the music that The Regent played between sets, which included a lot of local bands and kept the audience energetic throughout the night. JJUUJJUU started off the night with mellow chords and hypnotizing vocals. Their spacey set created a good base for the next few hours that gained momentum. Froth followed JJUUJJUU’s performance with a similar lo-fi tone and lead singer Joo-Joo Ashworth’s breathy voice. I was particularly excited to see Froth perform their newest album Outside (briefly), which was released in late February. The band delivered a stellar set that was elevated by the group’s signature Omnichord beats. 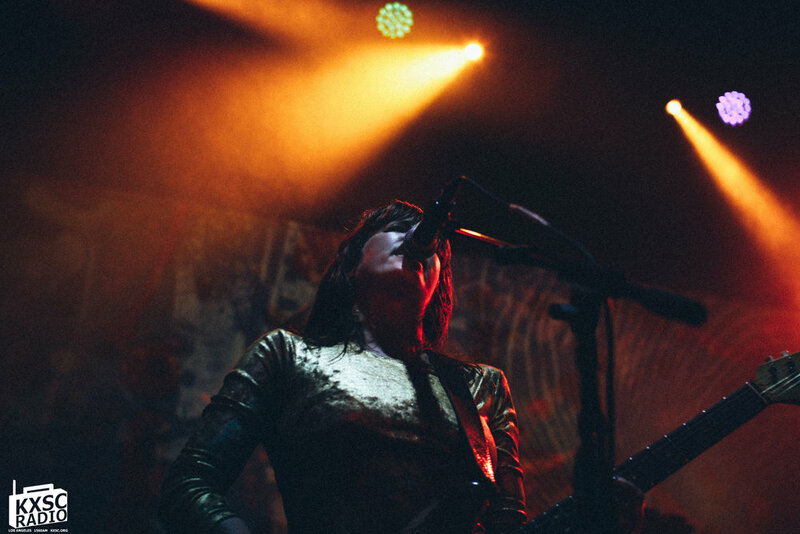 After Froth, Deap Vally took the stage and immediately garnered attention in sparkling bodysuits. The female duo had a distinct visual and musical style that left the audience intrigued. Their presence was magnetic and the drummer’s constant head banging made everyone in the theater want to do the same. Even though Deap Vally’s heavy rock vocals aren’t my usual music preference, their music talent and passion got me dancing and loving their feminist inspired lyrics. Next up was Night Beats, and the show’s unifying theme of psychedelic rock returned. The effortlessly cool Seattle band delivered an eery set with strong guitar and drums. The audience loved their beach rock vibes which created the perfect setup for the main act, Temples. To put it simply, their performance was straight out of a sci-fi movie. Bright blue lights shone on the audience as Temples stepped out from behind stage to the spacey synth beats of their new song, “All Join In.” As the high-pitched echoing vocals kicked in, the figures of the band began to take shape. Both in musical and clothing style Temples seemed as if they stepped straight out of a time machine. I believe I can speak for everyone to say the opening song was not an outlier in the band’s beautifully hypnotic set that night. Although their new album Volcano was only released a day before the concert, the audience (including myself) sang along to every song and couldn’t help but dance in a pure euphoric state. None of their songs fell flat due to their diverse use of synth and unique lyrics, yet their single “Strange or Be Forgotten” was an obvious crowd favorite. Temples revealed a pure talent and vision through their performance at The Regent, and based on my experience, Temples should have no fear of being “forgotten” anytime soon. LIKE BUTTER, THURSDAY 10 A.M. - 11 A.M.